Hoved-fi - Vis emne - FiiO E11 power supply. Is it possible to build a 5V(USB) to 3.7V step down? I ask because I got a FiiO E11 fairly cheap, and it cannot run while charging, and I want to be able to use this little amp at home without being depended on a battery charge. 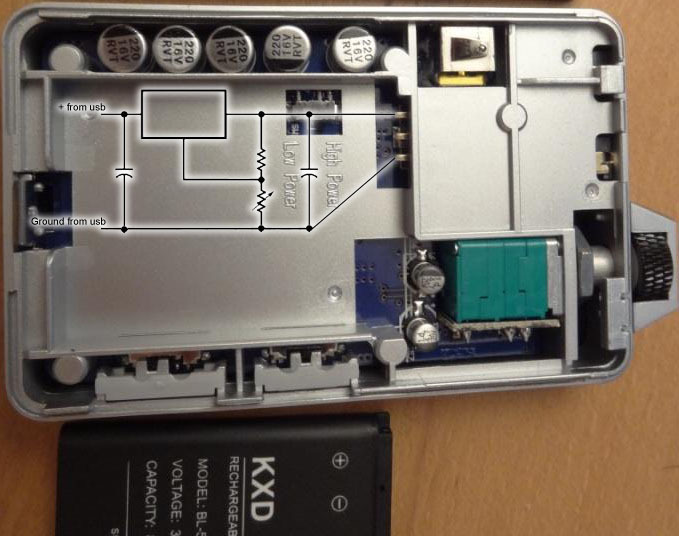 Something I found on google about the FiiO E11 and why it cannot run while charging. "The E11 uses a single 3.7V li-Ion battery and a DC-DC converter stepping it up to a higher single voltage around 9 volts which is then artificially split into +/- 4.5 volts. This puts the audio ground at 4.5 volts DC which is probably why you can’t use the amp and charge it at the same time. Connecting the audio ground to your PC’s ground would short out the E11’s OPA690 and power supply if it’s not an isolated DC-DC converter." So I want to build a 3.7V power supply, or what I hoped was easier, since everything has USB power nowadays, a 5V to 3.7V step down. I would like to run a wire into the shell of the old battery, to power the device, so I can still pull out the "battery" and insert a real battery for portable use. IS this possible? I'm an electrician(Alarms and stuff), so I have the basic knowledge about which end of the soldering iron I have to use. Re: FiiO E11 power supply. I figure you want to use a standard 5V power supply and lower the voltage to 3.7V and connect that directly to the player's PCB instead of the battery. When this is the case a simple LM317 + 2 resistors and 2 capacitors is all you will need to add. I would not recommend to simply connect a power supply in parallel to a lithium cell. These cells need charge control. I can post a schematic + calculated values if needed. Solderdude skrev: I figure you want to use a standard 5V power supply and lower the voltage to 3.7V and connect that directly to the player's PCB instead of the battery. I will ofcourse not put the power supply in parallel with the battery. I want to make a "dummy battery" with a wire coming out of it, so I can easily change from psu to battery. I would very much like a schematic with values. I am planning to write a guide. Seems like lots of people would like to use the E11 as a stationary amp. Will the LM317 plus components be able to deliver 800mAh like the battery? The LM317 can be used but it may be better to use the LD1086V36 instead. The LM317 has a minimal voltage drop that is close to the 1.3V voltage drop that is required. The LD1086 is a better option, it has 0.5V voltage drop at 1A (and less required for lower currents. 200mA is more than enough most likely though. The battery is 800mAh so if the battery usually can last 8 hours the current consumption is around 100mA. The schematic is in the pdf link above. Let me know if you need more info or cannot obtain this part. The LD1086V36 is discontinued at RS-online AND Mouser. What to do? In my first post I mentioned what NwAvGuy said about the 3.7V battery going into a DC-DC converter stepping up to 9V and then splitting to 4.5V on both plus and minus. So instead of using the E11's ground like in you're scematic, I should use the minus pin the battery should have been connected to, right? Yes, that will be the correct way to power the amp. However, the USB power supply MUST be isolated so I would not recommend to use the USB of a PC/laptop that is also used as the source of the music. The +/- 5V MUST have a 'floating' potential compared to the input of the amplifier. You can connect the 5V input of the circuit to an USB mains adapter for instance or use any other dedicated 5V DC mains adapter that is connected to the power supply circuit. Ok. I will be sure to use a mains adapter or maybe a powerpack, but not a PC as source. I will order the components now, and post my result when it is done. I can't thank you enough, and I really appreciate you taking time to help me.